Anti-gentrification holiday lights will illuminate gentrifying neighborhoods all over the city this year, organizers said. 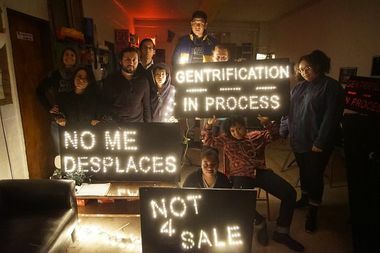 BROOKYLN — Activists and artists who illuminated Bushwick homes and businesses with anti-gentrification messages like "No Me Mudo" [I'm Not Moving], "No Eviction Zone" and "Not 4 Sale" last holiday season, will bring the festive yet political signs to rapidly changing neighborhoods all over the city this year, organizers said. Come Christmas Eve, several dozen illuminated signs will be strategically placed in gentrifying neighborhoods across New York including in the South Bronx, Chinatown, Inwood, Ridgewood, Jackson Heights and Flatbush among other locations, said the lead organizer Pati Rodriguez, 34. "This is happening everywhere, that's why we thought it was important to kind of spread the message," she said. “These signs are a low ray of hope that people are on their side, their neighbors are on their side." Rodriguez is currently raising money with a GoFundMe campaign to purchase materials and this Sunday, she along with other organizers at Mi Casa No Es Su Casa: Illumination Against Gentrification will host a public workshop in Bushwick where anyone is welcome to come help build them. And this year, the signs will also show solidarity with undocumented immigrants who fear another kind of displacement — deportation — in the wake Donald Trump election, who's promised to deport millions of undocumented immigrants, Rodriguez said. Those signs will read "Ningun ser humano es illegal,” [No human being is illegal] and “Trump. No Nos Vamos” [We're not going], she said. Rodriguez, hoped neighbors might be moved to support the work of Mi Casa No Es Su Casa, a collective of artists, most of whom were born and raised in Brooklyn and Queens. This Sunday's workshop will be held at Mayday Space in Bushwick at 176 St. Nicholas St.